Established in 1907, the department operates a full water rescue team as well as one of only three rescues in Zone 4. 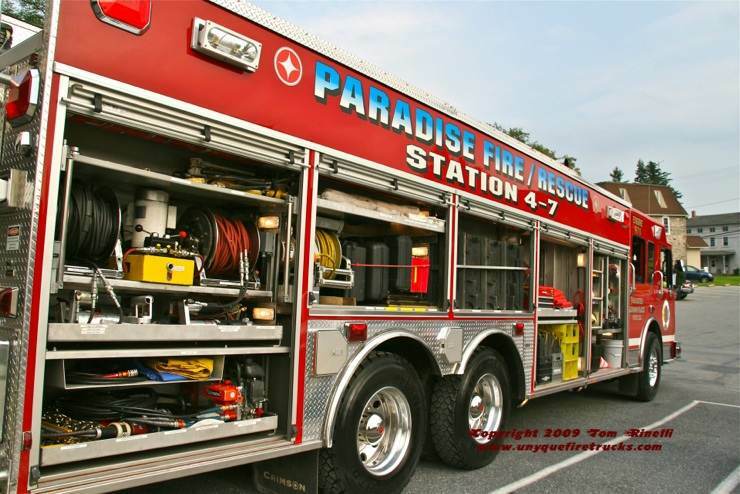 Answering an average of 125 alarms annually, Paradise’s 58 volunteers include many members of the Amish farming community they protect. 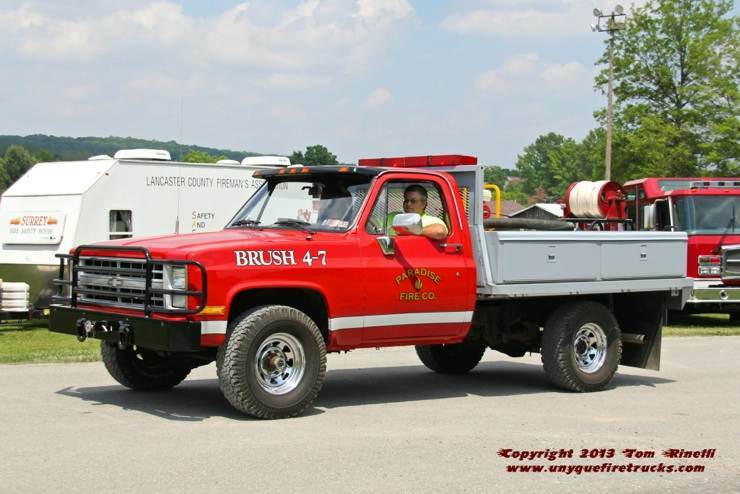 Engine 47-2 - 1988 Simon-Duplex/Grumman 1250 gpm/1000 gal. 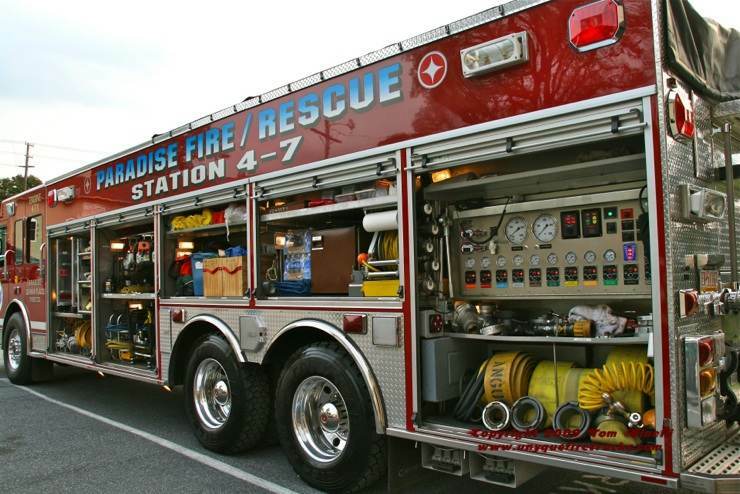 Formerly responding first due to structure fires, this rig was equipped with five SCBA’s. It has since been sold awaiting the arrival of a 2013 Pierce Dash CF engine - until its’ arrival, the company is using Engine 45-1 from the neighboring Kinzer Fire Co. in exchange for the use of their Squad 4-7, a 2008 Chevy pick-up that was donated to the company by 55 year member Ray Leaman in memory of his wife who passed away in 2007. 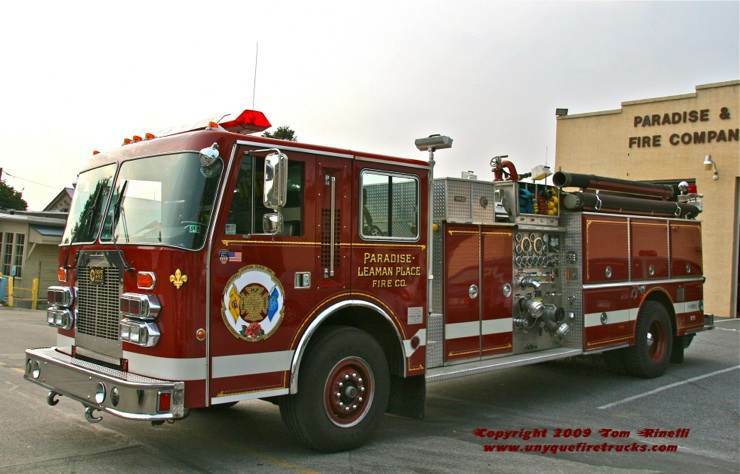 Rescue 4-7-1 - 2004 Spartan Gladiator Evolution/Crimson 1500 gpm/1150 gal. 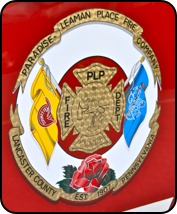 Operating as a rescue engine, this rig provides mutual aid support to numerous surrounding fire companies as it is one of only three rescues within Lancaster County Zone 4. Rescue 47-1 is fully equipped for both fire & rescue operations - its’ impressive equipment arsenal includes pre-connected Amkus & portable Holmatro extrication tools, air bags, air powered tools, cribbing, a portable winch with multiple receiver positions, electric cord reels, a mini-fridge for rehab supplies, multiple rotary saws, a PPV fan, BLS level EMS gear, water rescue equipment, spare SCBA cylinders & engine co. equipment. Assembled in-house by Company 47 members, this unit was built utilizing a DCNR grant & donations from local businesses and fire companies. The Chevy pick-up chassis along with the tank, front bumper, bed modifications and plumbing were donated by local businesses while trade school students provided the body work and paint in exchange for “real world” experience. The warning lights, siren and radios were from former PLFC rigs while rescue lighting from the Ronks Fire Co. was used for the tail lights. The Kinzer Fire Co. donated 2-1/2” hose for use as supply line while the forestry hose, rakes, pumps, nozzles leaf blower & chainsaws were purchased through the DCNR grant. 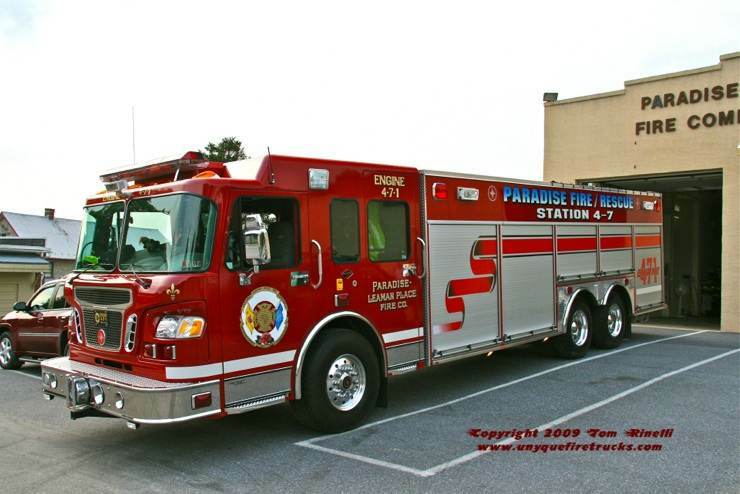 Special thanks to FF’s Pat Cosgrove & Ray Leaman for their hospitality & assistance with the photographing of these rigs. 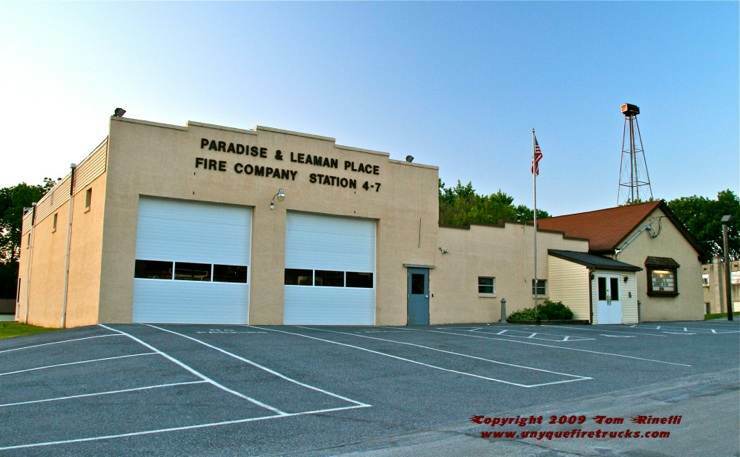 Paradise operates from this two bay station as well as a garage in the rear set up for the water rescue team complete with trailered boats and gear racks with helmets & PFD’s for each individual member.